The seemingly vulgar sentiment, which appears to begin with “We fondly say go …”, can be seen scribbled in the bottom right corner of the middle panel in Non Sequitur, by cartoonist Wiley Miller. The Butler Eagle story about the comic strip. The message did not go unnoticed by GoComics readers. Cartoonist Wiley, on Twitter, doesn’t seem to be denying it. UPDATE: The AP is now carrying the story. Cartoonist Wiley Miller and Andrews McMeel Syndication have issued statements. 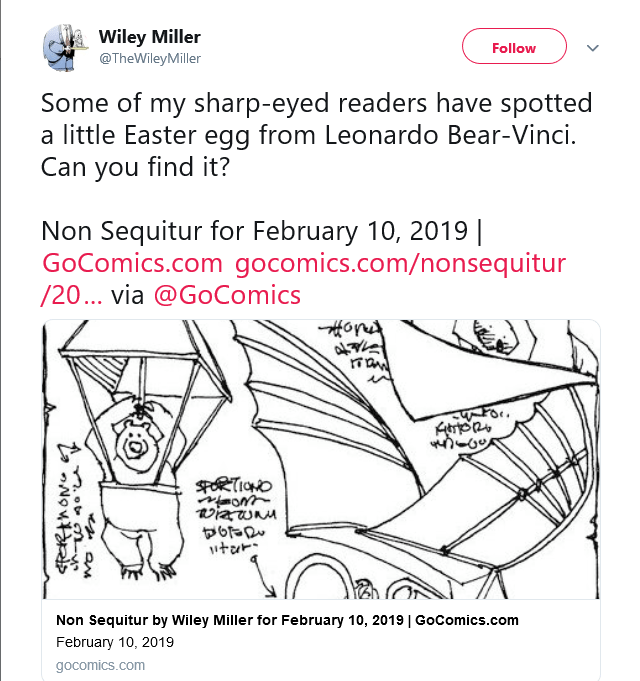 Regarding the “Non Sequitur” Sunday comic published Feb. 10, containing vulgar language, we are sorry we missed the language in our editing process. If we had discovered it, we would not have distributed the cartoon without it being removed. We apologize to Non Sequitur’s clients and readers for our oversight. When I opened the paper Sunday morning and read my cartoon, I didn’t think anything of it, as I didn’t notice the scribbling that has now caught fire. It wasn’t until later when sharp-eyed readers pointed it out that I remembered doing it, as the cartoon was done about eight weeks ago. I now remember that I was particularly aggravated that day about something the president had done or said, and so I lashed out in a rather sophomoric manner as instant therapy. It was NOT intended for public consumption, and I meant to white it out before submitting it, but forgot to. Had I intended to make a statement to be understood by the readers, I would have done so in a more subtle, sophisticated manner. 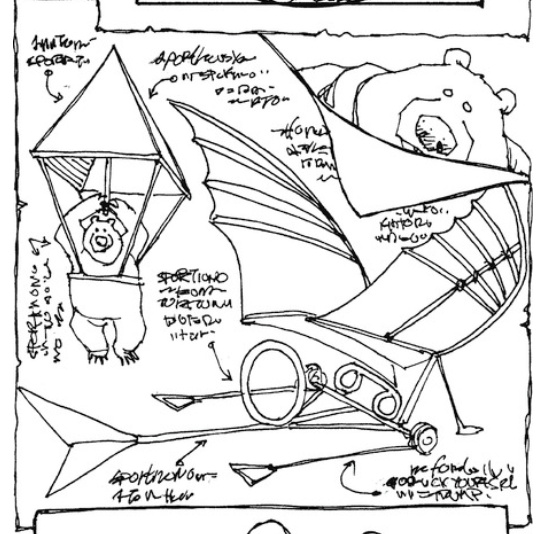 This coming Saturday will mark the 27th anniversary of Non Sequitur, and in all that time, I have never done anything like this, nor do I intend to do so in the future. The full NBC News story. The News was among four or five newspapers that had dropped the cartoon by Monday afternoon, according to a spokesperson for Andrews McMeel. We must be able to trust that the people who provide content to The Dispatch will uphold the high standards we have set for this newspaper. That includes those who draw the comics. I love Wiley’s work, and I fear for his future at Andrews-McMeel now that he’s decided to channel Jim Carrey in a cartoon. But this is the sort of thing that convinces the Trump Loyalists that our revulsion at Mr. Trump can be attributed to some irrational hatred of the guy, rather than the fact that he’s a lying, intellectually lazy, narcissistic, boorish, bigoted egomaniac and a real and present danger to the Republic. That said, it’s too bad that Non Sequitur is probably not run in the Pittsburgh Post-Gazette. I feel for the poor cartoonist. I can easily see that happening, being an artist myself. It even happens with email: I’ve learned to be very careful with such “therapy”. I hope his career stays intact, I believe he’s telling the truth and it’s certainly understandable. Maybe after an apology and cooling off period, the Eagle will reinstate him. If not, lessons learned, and maybe it was worth it?! Vulgarities are generally best avoided, though. Way back when, I did a Bush cartoon with the words “Lame Duck” across the page. Bush’s bewildered head got in the way of the letter “D”. Some people, and ducks, took offence. 32 queries in 0.179 seconds.